Of course, if you are impatient, you might join a casino without knowing the terms. However, the blackjack dealer would ask you if you want to "Split" or "Double down," and you will probably make the wrong decision. Some terms are only characteristic for certain online casino games (you can't take Insurance on Slots Games, as Insurance is only possible for the blackjack game). However, there are some general terms that are used for every game. This option will allow you to place the maximum allowed bet in any casino game. Watch your budget while taking this option, as you could see your bankroll down to "0" in seconds! Ante is the initial bet on any casino game. Although the term is mostly used in online poker, the blackjack dealer will understand if you would ask him for an Ante bet. The banker is sometimes confused with the dealer. As we are talking about online casinos, you could say that the banker and the dealer are the same person. In the real casinos, the banker and the dealer are different. Bankroll is the total amount of money budgeted by the player. The bankroll can be considered the total amount of money that a player has at his disposal, or the planned sum needed for a certain game. The sum gambled by a player is called a Bet. More bets can be placed on a single round on certain games. For example, a game of poker consists of three or maybe more rounds, and a bet must be placed on every round by the players. The casinos are trying to prevent certain strategies such as Martingale. Placing maximum and minimum allowed bets is the best method. The minimum limit assures the casino that beginners and low-rollers can't join a high roller's tournament, while the maximum allowed bet makes the Martingale strategy impossible. This term is used mostly for Hold'em Poker. 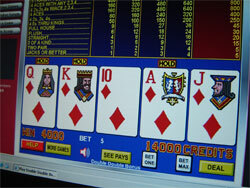 However, blind bets can also be placed on other casino games. A blind bet is a sum gambled without seeing your cards. It is a huge disadvantage for the player, as he can't apply certain strategies with blind bets. For the low-rollers tables and for free tables, the buy-in option is not available. However, for the exclusive tournaments, the buy in option makes sure that only the best players would join. The buy in fee can be 1000 dollars on certain contests; therefore, a beginner having 100 dollars as a bankroll can't join it. The call option is used to remain in the game. An opponent might place a higher bet than yours. If you want to stay in the game, you must "call" for the bet. You will have to place a bet at least equal with the opponent's, and sometimes you can rise if you are certain about your current hand.